It seems that every three months I crave seasonal sangria. I don’t know what this says about me but let’s just roll with it. Because it’s quite apparent that I have a sangria issue, as witnessed here, here and here, and in my opinion that is one of the best issues to have. Here’s the deal: do you love grapefruit? You should. We would be even better friends if you did. But I understand that it’s a little… sour, tart, whatever you want to call it and that it just might not be up your alley. I, as a matter of fact, LOVE GRAPEFRUIT. But you know this. I freak out over any and everything grapefruit, coating my lips in grapefruit lip balm, washing my hands with grapefruit soap, scrubbing my counter with grapefruit cleanser, wiping my face with grapefruit wipes and eating the heck out of as many grapefruits as I can. I adore the punch of tartness. That’s really what it is, right? Grapefruit flavor essentially punches you right smack in the schnoz. Especially when it’s an actual grapefruit. I probably love grapefruit scented/flavored things so much because they tend to be sweeter, but as I’ve whined about before, I love the actual citrus PLAIN as day. No sugar, nuh uh. I knew this sangria would work because a few weeks ago on a Saturday afternoon, my husband and I decided to play around with the grapefruit sorbet I had made (that stuff is like a drug) and a half-drank (drunk?) bottle of prosecco that was used for some recipe development. We spent a good hour dropping a giant scoop of frozen sorbet into an ice cold glass of prosecco. Then we drank it. It was delicious and in my mind, it was only going to get better with some additional white wine, more bubbles, simple syrup and strawberries. If I could inject this straight into my veins, I would. Wait… but then I wouldn’t taste it. Wait… why do people say that? I think I’ve got this wrong. I’ll stick to drinking it. Place fruit in a large pitcher then combine remaining ingredients and pour on top. Refrigerate an hour or so before serving. Oh and moral of the story: gotta love grapefruit to love this. Gotta. I am so excited to try this recipe. It sounds amazing!!! 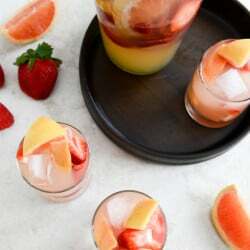 I gathered together a small list of drinks I want to experiment with this spring on my blog and I included this recipe :) Can’t wait to give it a try!! I liked it a lot, but next time I will just use 7up or Sprite instead of club soda and making a simple syrup.